Greenville Presbyterian Theological Seminary is a Reformed seminary in Greenville, South Carolina. They wanted a site redesign to make their site look more professional and navigable, to be able to accept donations online, and to be able to sell physical products online. They wanted the site to appeal to students and donors. The visual design is based on their brand identity, and is professional and navigable. The homepage introduces the seminary and gives an overview of its programs and community. 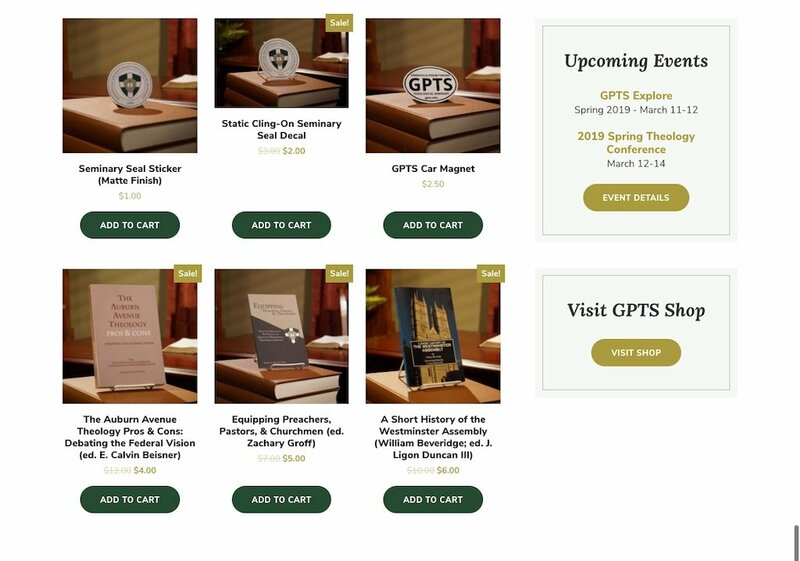 It also includes several calls to action to guide visitors to engage with the seminary. The Faculty & Staff page displays individuals, with links to separate bio pages for many of them. The News page shares updates about the seminary in a visually attractive way. Social sharing and comments invite readers to engage. The Conference page provides details about an upcoming conference, including speakers, schedule, location, frequently asked questions, sponsors, and more. The seminary is able to reuse this page template for future conferences. The shop is an ecommerce store that sells products such as books, stickers, and magnets. There are several funds which donors can choose from, to donate online. The site uses a mobile-friendly (responsive) design, so it works well on mobile devices as well as desktops. 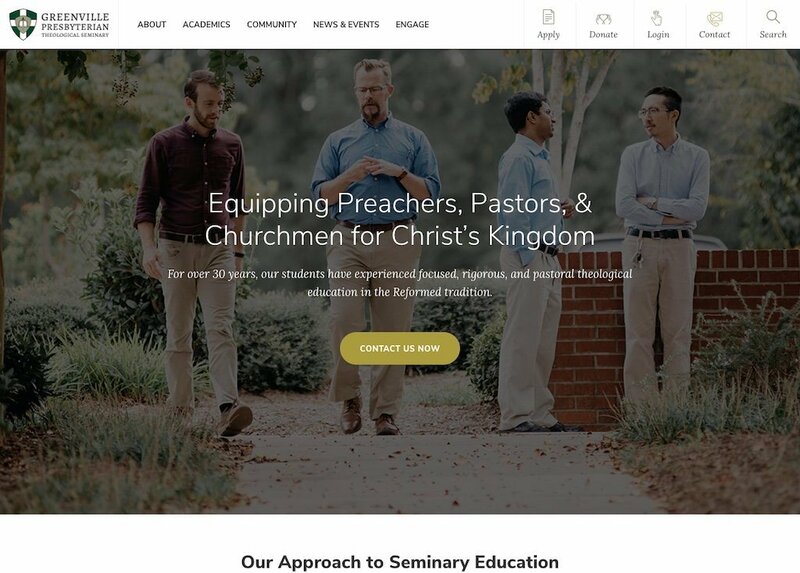 The site is powered by WordPress, so the seminary can edit the site’s content themselves. 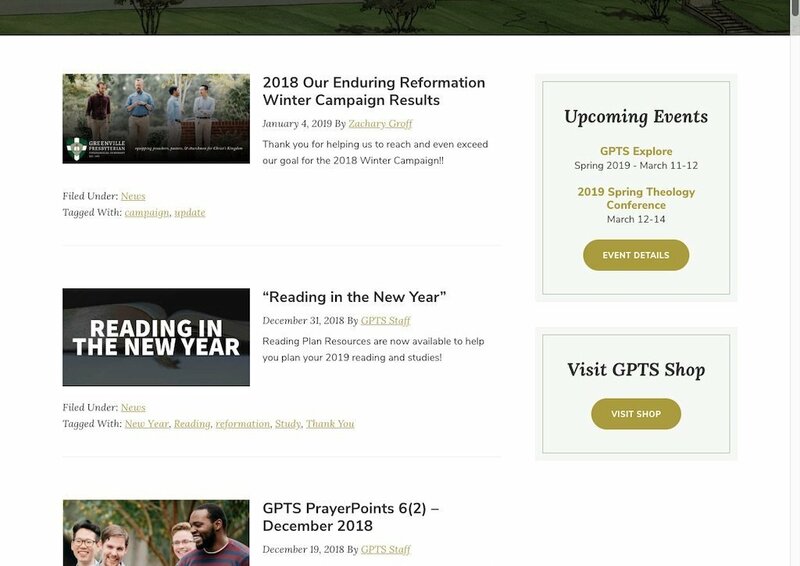 I recently partnered with Optimwise to redesign the website of Greenville Presbyterian Theological Seminary (GPTS) on the WordPress platform. The Optimwise team did a FANTASTIC job for us, and we could not be happier with the end result (gpts.edu). All aspects of the experience of working with Optimwise were as enjoyable as a website redesign can be. Most significantly, Optimwise really "owned" the project, functioning as efficiently and devotedly as an internal resource would be expected to function. 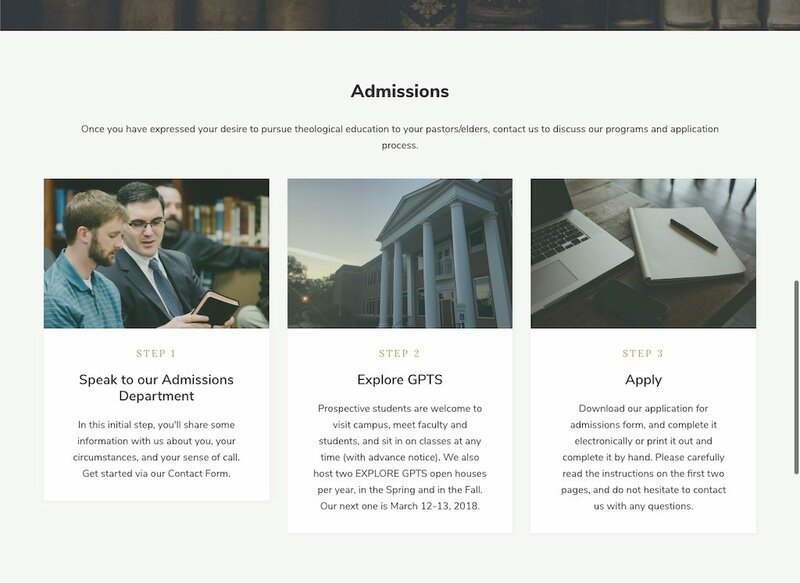 This "ownership" on Optimwise's part was so important because our small (but growing) school has a multifunctional Advancement/Admissions team that also oversees all Marketing, Promotions, and Communications. Having Optimwise on board took a lot of stress/pressure off of our already hard-pressed team during a crucial time of year. I greatly appreciate Optimwise's unique Discovery process, and the team's philosophy behind how best to manage a web design project. OptimWise's approach is highly compatible with my own approach to projects and design work, and I'm looking forward to future projects with them. I would HIGHLY RECOMMEND Optimwise to any organization or corporation looking for a website refresh.